As is traditional, now that Tomb Raider fans have settled in and started murdering the local fauna, Square Enix has revealed a few useful statistics. Lara clearly has a crab fetish; she's chowed down on over 1.4 million of the things, without benefit of melted butter. That said, given the choice she'd much rather sink her choppers into Bambi; 5.2 million deer have gone to their reward so far, to feed her insatiable hunger. An archaeologist has to eat, but if Lara's a terror to the local wildlife, then that goes double for anything on two legs. Over 147 million enemies have fallen to her bow - 20 million of which went up with a gentle foom! 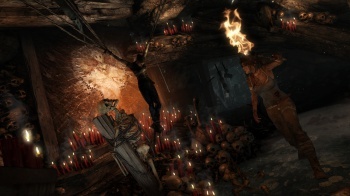 from fire arrows - but, careful warrior that she is, Lara retrieved over 356 million arrows from her fallen enemies. Waste not, want not. Also? Ouch. Maybe shooting straight would be the better option there, Lara; two arrows or more per target seems a painful way to go. That said, Lara's pretty good at dodging enemies, so perhaps the opposition ought to be taking some tips. She's dodged attacks 11 million times, and cheated death over 13 million times so far. But this is Tomb Raider, so the one question on everyone's mind is, howsabout dem tombs? Square Enix hasn't neglected that vital statistic: 3,570,956 tombs have been raided so far. "Keep playing, and we'll keep on tracking," says Square Enix. So if you happen to be standing at a tomb entrance right about now, bear in mind: Big Enix is watching you, and Lara's not going to break the 4 million tombs raided mark by standing around all day. Get in there!